An honour roll commemorates those from Karoola and Turners Marsh who served in World War One. It lists 25 names. 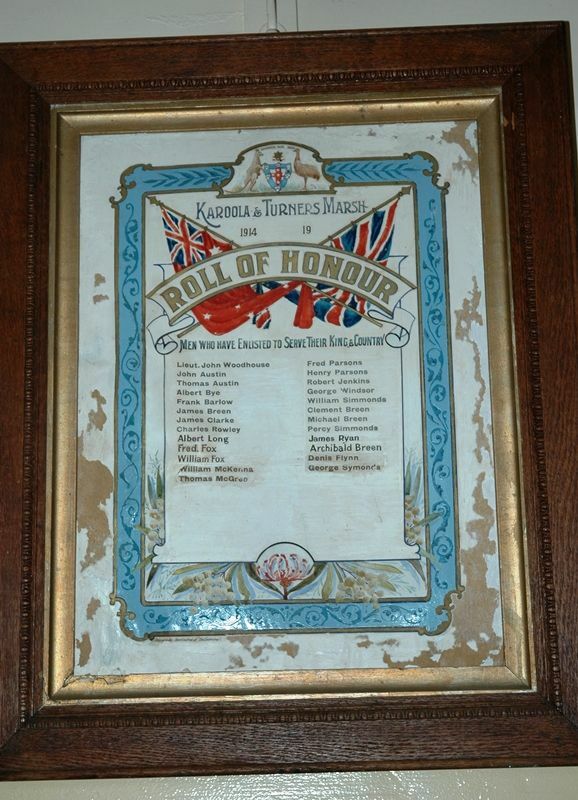 On Saturday evening an entertainment and social was held at Karoola, the occasion being the unveiling of a "roll of honour" to the young men who had gone to serve their King and country from Karoola and Turner's Marsh. The Roll of Honour was hung in an effective position on the wall in the centre over the platform, and was veiled with a large Union Jack. It was nicely illuminated, and artistically decorated, having been executed at the offices of the "Examiner" and "Weekly Courier." Rev. W. Greenwood performed the unveiling ceremony, after which he gave an address suitable to the occasion. Launceston "Examiner" & "Weekly Courier"